Whoa. How is it already week #3 of 6 in the One Room Challenge? I had a fabulous trip to Salt Lake City last week, but in between all the learning and the fun with friends, I was thinking about all the things we’ve got to knock out in the bedroom in the next three weeks. Somehow right before I left, we did finish painting three walls and the ceiling (everything except the feature wall). 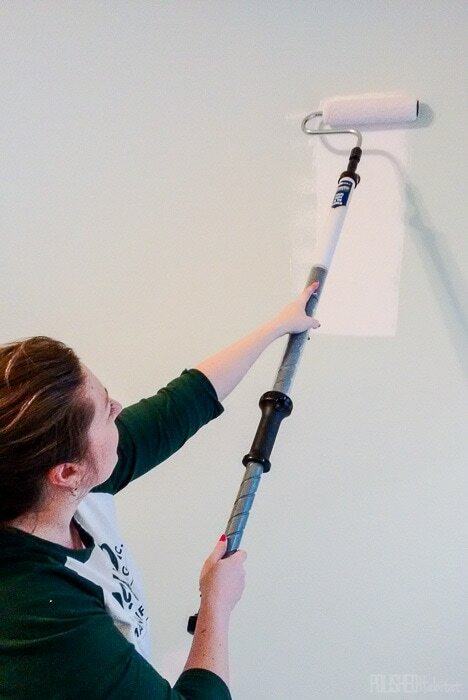 Stay tuned to the end of the post to enter a giveaway for my FAVORITE wall painting tool, the HomeRight Paint Stick. Last week, I left you wondering if we would go with a pink or a gray for the walls. I think the majority ended up voting for gray, but I’m a rebel! 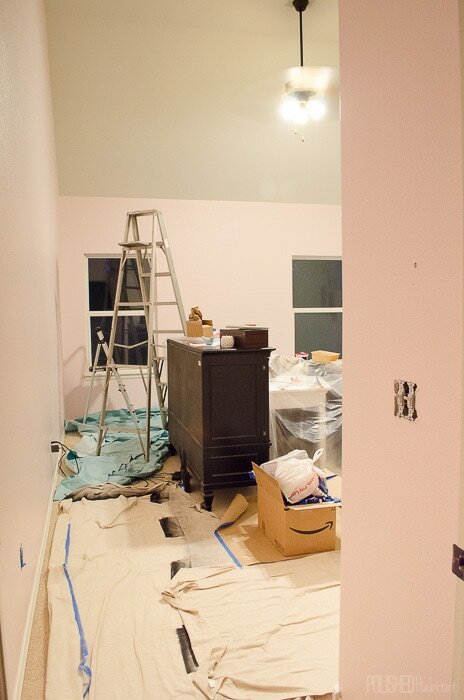 Three of the walls are going to be Sherwin-Williams Verbena, which is that gorgeous, soft pink. The feature wall behind the bed will be the same white as the ceiling. To make my final decision, I painted a large section of the wall between the windows Verbena on one side and Repose Gray on the other so I could see what they looked like with the art from Minted. Seeing the moody art pop against the pink sold me. It definetely wasn’t the safest of the two options, but for me, the ORC is all about taking risks and pushing myself to try new ideas. Once I did the hard work of picking a color, I still needed to get that pink on the wall. 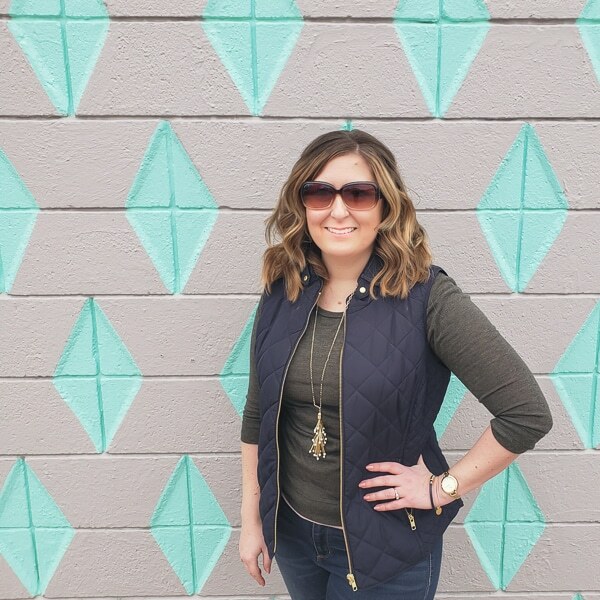 If you remember the closet One Room Challenge, I partnered with one of my favorite DIY brands, HomeRight, on all the posts. They are back this week because I can’t paint a room without a HomeRight Paint Stick! The Paint Stick holds a TON of paint in the handle, so I save so much time not having to bend over and reload the roller again and again. Instead, I can paint a HUGE section of wall without reloading it. Just twisting the handle releases more paint onto the roller. Brilliant! Since HomeRight is awesome, they’re also providing a giveaway for a PaintStick at the end of this post! Woo hoo! 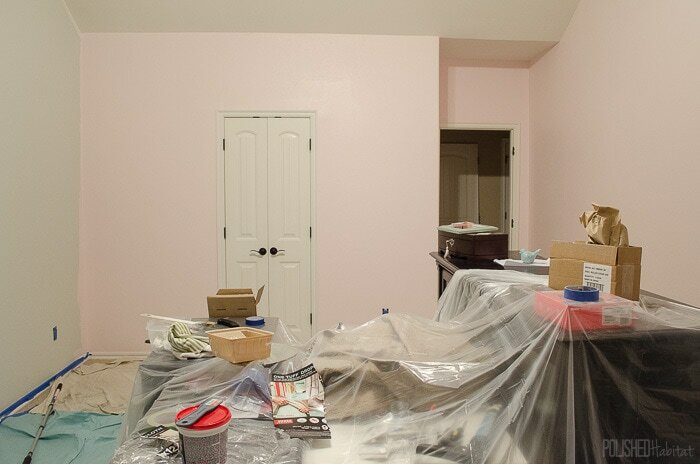 After two coats of pink on the wall and two coats of white on the ceiling, here’s what the room looked like! We are loving how much the color changes from BARELY pink in the sunlight, to more attitude at night. I can’t wait to get all the art up. Here’s what the other side looks like now. That wall that isn’t painted will be the feature wall behind the bed. In the original plans, it was going to be a very symmetrical grid feature, but I had a new vision! I think I’m going a different, more random-diagonals direction, but we’ll see how good we are at figuring out angles. It could be AMAZING if it turns out like I see it on my head, but we’ll find out when we start working on it this weekend. When I returned from my trip, we shifted things around the room so I could paint the furniture. I’m pretty sure the dresser weighs the equivalent of an elephant, so there was no way we could move it to the garage for painting. Thankfully, Rust-Oleum has the Metallic Accents line of non-spray paint that I can use in the house. I went with the color Sterling Silver and it is incredible. 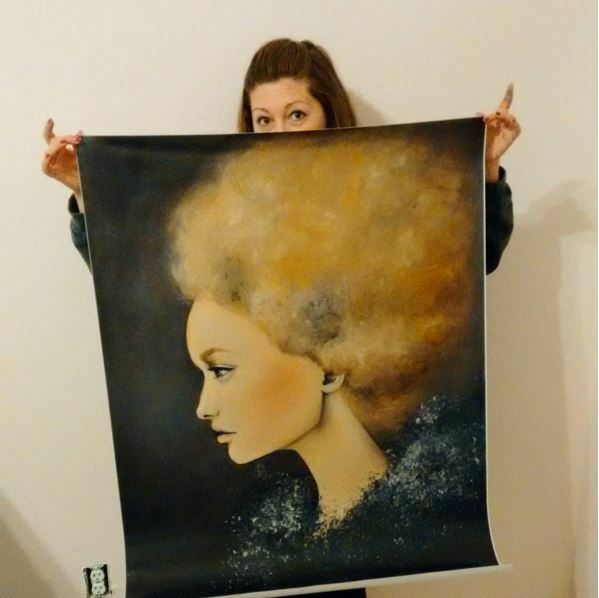 I may love it more than gold spray paint, and that is saying A LOT! Here’s a peek at my progress. Can you believe how much better the nightstand looks in silver than in it’s original black finish? It’s like it was MADE to be that color! Oh! And the bed that I spent literally 20+ hours picking out arrived and is PERFECT. I’m working on a post of all the things I learned trying to pick out a bed online. Who knew there were so many potential pitfalls!?! The two large Leigh Viner pieces for the wall across from the bed were also delivered while I was gone, and are even more gorgeous in person! Here’s a snapshot of one of them. I’m in love. Along with the UPS driver’s workout from delivering all those goodies, our credit card got a serious workout. I finally decided on a rug (this one) and a ceiling fan (this one). It’s funny, I thought I barely got anything accomplished this week, but it turns out that big progress was still made. I’m still VERY nervous that the clocking is ticking down too quickly though. We still have to start AND finish the feature wall, build a zillion picture frames, install the fan, blinds/drapes, and style the room. I haven’t settled on bedding or an accent chair, and will need a variety of accessories to finish out the space. Oh, jeez, and that super-secret art project of the bed has been started as a draft on paper, but not actually started at full scale. Send wine and energy bars! Before you head over to Calling It Home to check out the rest of the One Room Challenge spaces, make sure you enter the Paint Stick giveaway below. You can also get one more chance to win a Paint Stick over at Blue i Style. She’s making over her master bathroom during the One Room Challenge, and just happens to have been painting this week and giving away a Paint Stick as well! On your phone or tablet, click “A Rafflecopter Giveaway” to enter. If you’re on the computer, you should see a form below. « The SLOW Guest Room Progress Continues! I love the pink paint! I am seriously thinking I need to paint a room that color now. I agree that the ORC is about taking risks and trying new things! Can’t wait to see how your feature wall turns out! Melissa, everybody needs a pink room! I don’t have one and may have to change that soon. Painting and having all those things delivered looks like a lot of progress to me. The silver paint is very neat! Thank you Stacey! I never felt this way before, but now I’m totally with you that everyone needs a pink room! Melissa! The pink is so good and I LOVE the Leigh Viner! It’s coming together so well. Thank you Arielle! It is SO nice to slowly be checking things off the list. I’m ready for it to be done so I can enjoy it! Oh My Goodness…your room is coming together beautifully! We love the pink walls and those silver nightstands are perfection. You were not kidding us when you said there would be tears LOL…but we are pushing through. 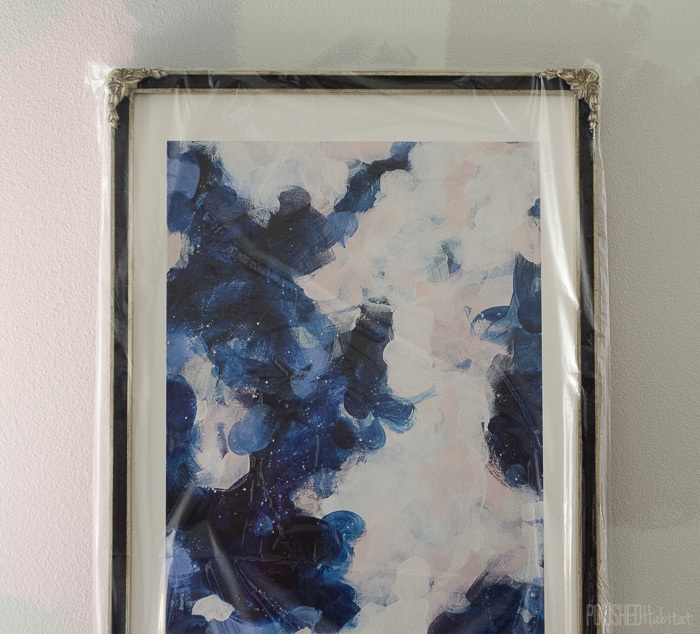 Can’t wait to see all of your artwork in place and we are so curious about your feature wall! Cheers to a great week. LOL, I hate that I was right about the tears! I haven’t had any yet, but I have a feeling the feature wall may be tear-inducing. Can’t wait to pop over and see your closet progress. I’m so glad you are pushing through! You can do it! Wow girl! You’ve got a lot done! Love, love the silver paint, and I applaud your bravery with the pink paint – I think the payoff will be huge! Another great makeover in the works Melissa! I love the pink. I’ve been eying that same shade. I might have to use it someday real soon 😉 And your art picks are so fab!! Thanks Jen, that pink is amazing. I’m hoping when the blinds arrive to diffuse the sunlight I’ll be able to get a better picture of how awesome it looks in the morning. SO soft and barely there! You got so much completed. I really like the wall paint color and the art is all sorts of amazing. Thank you Brandy, I’m SO obsessed with the art! You have made incredible progress! I really like the pink paint (did you have to convince your husband to go pink? I think mine would’ve balked) and how much it makes the art pop. Oh, and I’m also drooling a bit over your silver nightstand. I’m off to check out that line of paints now! Thankfully, at this point he trusts that my craziest ideas are usually the best! It may have also helped that I put all the swatches on the wall before saying “Let’s paint the room PINK”! That way he could see how awesome it looked with the art as well. WOW! The nightstands are gorgeous in silver! 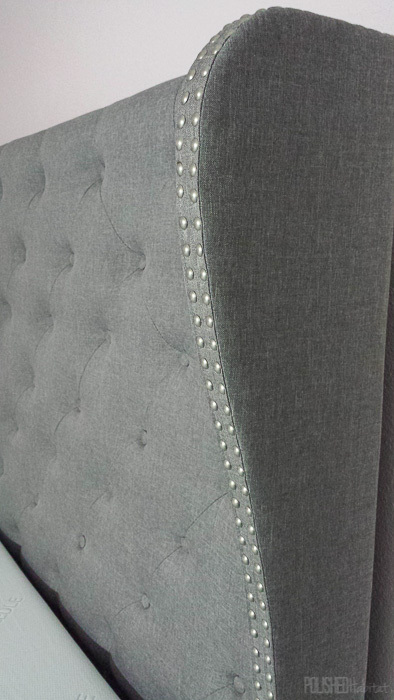 The headboard details are swoon worthy! Thanks Joy! It SO nice to see things coming together after countless hours trying to make decisions! The pink walls with the art is awesome & I love the large scale Leigh Viner! Your space is going to be awesome. Thank you Hollie! Can’t wait to get those big prints framed and on the wall! I have to admit, I picked the gray…but seeing the art against the pink, I think you made the right choice. It looks awesome! And those silver nightstands are to die for! Thanks Wanda! It was a bit of an unfair question last week since I had already seen the art against the wall, but it was so fun to hear everyone’s choices! Thanks so much Jess, I’m dying over the art too! I was seriously killing me that it arrived while I was out of town. I couldn’t wait to get home and drool over it in person. 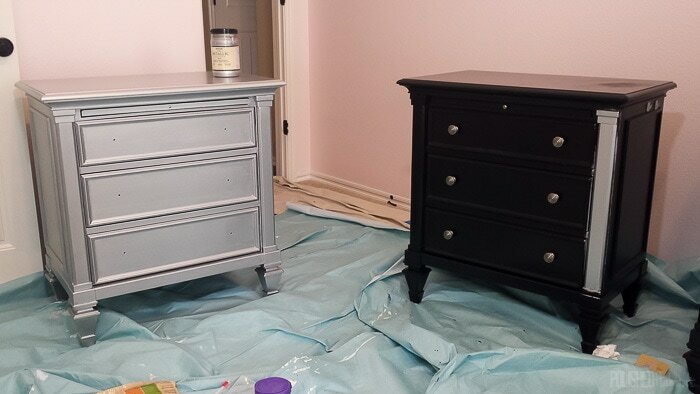 I love the night stand and its sure is amazing how much brighter it will make the room in silver/grey. Painting looks well done Will enter giveaway. This is my first OCR and loving every minute of it. The new brightness in the room is WONDERFUl, although I also can’t wait to add the darker accents like the drapes and art. I just want to hit fast forward and see the finished product! I love the silver paint on your bedside tables! I just purchased black paint for mine but now I am wondering how I could incorporate some silver! I’d love to have mirrored furniture but it is just not in the budget! 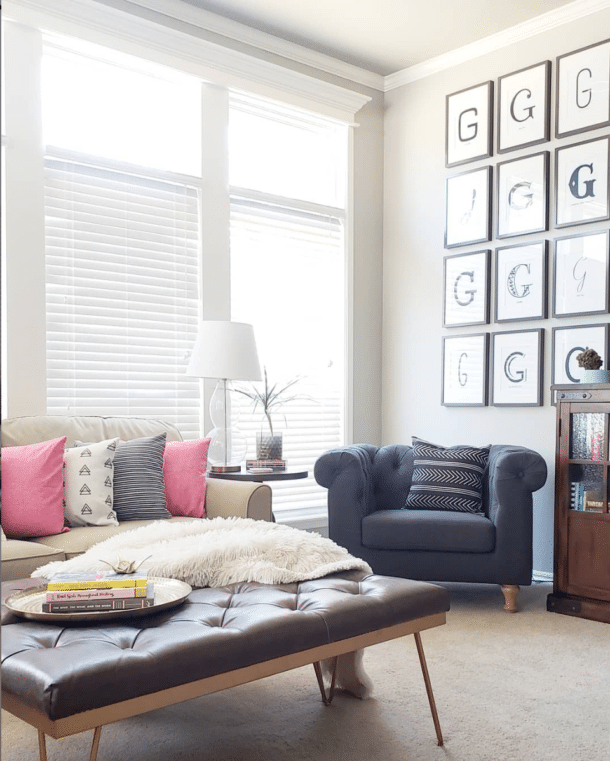 This paint gives the glam of a mirrored piece without the price tag or fingerprints. I want to paint everything with it now! That pink is so pretty. It looks so glam and fabulous, I can’t wait to see it decorated. Yes. Pink was the right call. I love how the art pops against it too. I need to try that paint stick. Can’t wait to see how this all comes together! That silver nightstand is AMAZING! Can’t wait to see the finished product. Bummer that you lost that discussion!